Tisha B’Av — the 9th day of the Hebrew month of Av — is a fast day that commemorates the destruction of the Temple in Jerusalem nearly 2,000 years ago (in the year 70 CE). The Temple was the center of Jewish worship, and with its destruction Judaism itself faced a spiritual crisis. Traditionally it was felt that the Temple was destroyed due to our sins — namely civil discord. Ever since, our liturgy has focused on our spiritual “exile” from Jerusalem and, with our sincere remorse and repentance, the hope that the Temple could be restored. 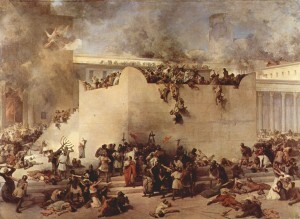 Tisha B’Av contains elements that help us understand the enormity of that historic and tragic event. Tisha B’Av is the culmination of a three-week period that begins on the minor fast day of Shiva Asar B’Tammuz (17th of Tammuz). It is a day of mourning and fasting in the Jewish calendar. We will join with our friends from B’nai Shalom of Olney and Shaare Tefila in this commemoration of the destruction of the Temple in Jerusalem in 70 CE. 9:30 pm (at Shaare Tefila (16620 Georgia Ave, Olney, MD 20832) – Participants are encouraged to bring small flashlights. Leather shoes are traditionally not worn. 9:00 am (at Tikvat Israel) – Shacharit (morning) service. Our observance will include a brief Torah reading and a haftarah. As a sign of mourning, Tallit and tefillin are not worn. 7:00 pm (note different time, at Tikvat Israel) – Mincha service. Tallit and tefillin are worn. The Torah will again be read and haftarah chanted. Note: The full fast ends at approximately 9:10 pm.